In 2015, the Hubble Space Telescope detected a strange feature in the skies over Neptune—a swirling dark vortex the size of China. Packing copious amounts of hydrogen sulfide—the chemical ingredient that gives farts their awful smell—this storm is not behaving as astronomers predicted, with the latest results suggesting the dark vortex is dying. 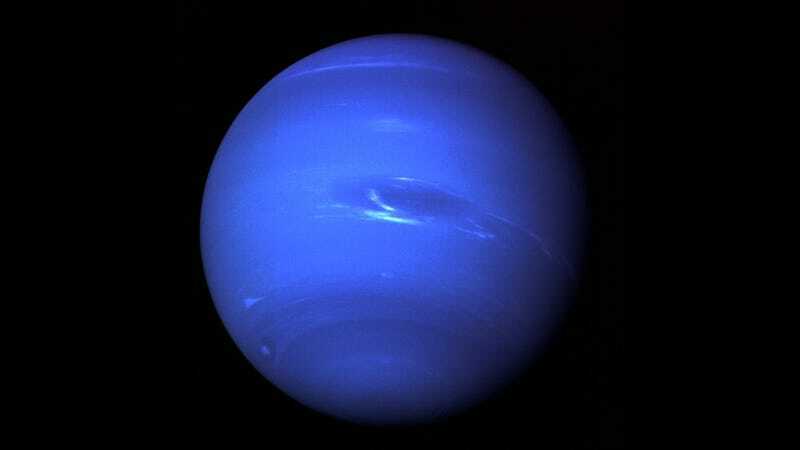 Neptune’s dark vortices were first discovered in the late 1980s by NASA’s Voyager 2 spacecraft. In all, only five of these dark spots have ever been documented on Neptune, the farthest planet from the sun, with the most recent one appearing in 2015 (dubbed SDS-2015, meaning “southern dark spot discovered in 2015"). There’s literally only one instrument currently in operation that can detect and track these vortices, namely the Hubble Space Telescope. Using its Wide Field Camera 3, Hubble can see the otherwise invisible movements on Neptune’s cloudy surface at blue optical wavelengths. As best as we can tell, these vortices form when clouds of gas and air in Neptune’s atmosphere swirl and freeze in the cold temperatures. The frozen mass then drifts in the atmosphere like a gigantic pancake. These storms spin in an anti-cyclonic direction, similar to Jupiter’s famous Great Red Spot. As it churns, Neptune’s vortex pulls up material from deep within the planet’s atmosphere, including copious amounts of hydrogen sulfide, which smells like rotten eggs and nasty farts. But unlike Jupiter’s spot—which has been lingering for at least the past 200 years—these storms are relatively fleeting, lasting only a few years. New research published in the Astronomical Journal shows that SDS-2015 is now entering into its death throes. Observations made from September 2015 to October 2017 show that the spot’s contrast to the surrounding area dropped from about 7 percent to 3 percent during this period. The clouds in the dark spot are still highly reflective, but slightly darker than the particles in the surrounding atmosphere. The new study, which included astronomers from UC Berkeley and Spain’s University of Basque Country, is the first to show a vortex’s death stage in action. Astronomers theorize that the vortices arise from an instability caused by the sheared eastward and westward winds, and they’ve created models to predict the movement of SDS-2015. But as the recent study points out, the models have not matched reality, and the spot is behaving unpredictably. So the vortex, which was first seen in the ice giant’s mid-southern latitudes, is not going out with this expected bang, and is instead slowly fading away into oblivion. Its fate may have something to do with the unexpected direction of its drift. Neptune’s gigantic fart is currently moving very slowly in a southerly direction, traversing a distance of about 1.7 degrees to 2.5 degrees of latitude each year. Unlike Jupiter’s Great Red Spot, which is kept in place by broad jet streams, Neptune features just three broad streams—one that blows westward at the equator, and a pair that blows in an eastward at the poles. This allows Neptune’s vortex to be a shiftless drifter, changing its “traffic lanes” in ways that are difficult to anticipate. The latest study shows that Neptune’s vortices are highly variable, transient, and recurring features; they’re like snowflakes, similar but not exactly the same. The astronomers will continue to monitor the vortex with Hubble, and we’ll see where it goes from here—and if and when a new dark spot appears.